One of the educative and entertaining games is The Alchemist. With this game, you can have an eternal fun and entertainment. If you’re a student, you can enjoy it more. 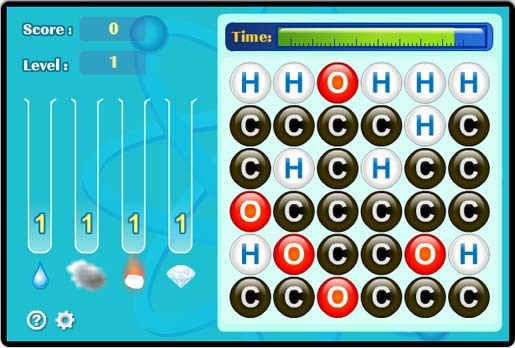 With this nice interfaced game, you can use the simple logic to form molecule by arranging atoms. You can have a grid of atoms of carbon, hydrogen and oxygen. Quickly forming molecules by arranging these atoms in a particular sequence is your task. For example, one hydrogen, one oxygen and then one hydrogen will form one water molecule. There are 4 types of molecules that you can form: water, carbon dioxide, methane, and diamond. When the molecules are formed, the atoms will disappear and new atoms will fall from the top. In each level, you will need to create the specified number of each molecule. You lost the game if you cannot create the molecules within the time limit.